The 3rd fixture in the Borders Road Running League 2016/17 season takes place at Birkenhead Park this Sunday 4th December. The 5.5 mile race starts at 11am. For further event club information, contact Arwel Lewis: arweleryri@gmail.com or Tel: 07772302411. £3 per team + £1 per extra member. Remember to bring : head torch, watch, pen/pencil, reflective clothing. We are getting together with the Eryri Harrier junior training session on the Sunday morning to give a monthly orienteering / map reading session. The session will be for 1 hour – with fun games and exercises to introduce simple map reading and navigation. Parents are welcome and encouraged to stay, if you are new to orienteering as a family it is an opportunity to learn together. Navigation is a brilliant skill to learn and teach your children. 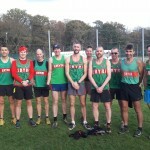 Quick reminder about BANGOR CROSS COUNTRY this coming Saturday 26th November, first race at 2pm (women, U17s and MV70s) and second race at 2.45pm (all other men) – hosted Eryri Harriers! Look forward to seeing lots of you there running, supporting and helping if possible. We need CAKES, CAKES, CAKES please to Ann/Sharon/Karen at the pavillion and also HELPERS – if you can help on the day please send me a message to let me know. We need a couple more people to assist with marking the course (10am meet if you can make it that early), a few more marshalls for during the race (from 1.30-ish onwards) and the more the merrier for helping take down the markers at the end of the men’s race. Otherwise, please come along and enjoy running and the team atmosphere! Looking forward to it and any queries, drop me a message on facebook, or an email: bex85@msn.com. Eryri’s Russell Bentley carried on with his good form of late after a superb win in the Snowdonia Marathon three weeks ago; most people would have taken a bit of a break but not Russell! Last week Russell finished 4th overall and 1st MV/35 in the Cheshire 10k (31:25) and on Sunday 20th November, Russell added another title to his tally by winning the Conwy Half Marathon in a very good time for the course which includes a loop of Llandudno’s Great Orme of 69:47 nearly a minute clear of runner-up James Douglas (Border Harriers) 70:40. Amongst the 2,408 finishers, there were 25 Eryri Harriers competing with Dewi Owen just making the top 10 for 2nd MV/35 behind Russell in a time of 78:40. Notably, Andrea Rowland finished 4th female in a time of 86:16 while Derek Weaver had a stormer to win the MV/60 title in 92nd place overall with a time of 89:24. A glorious day for the event run in sunny conditions well organised by Chris Yorke and his Runwales crew. Team bronze medal in Glasgow! 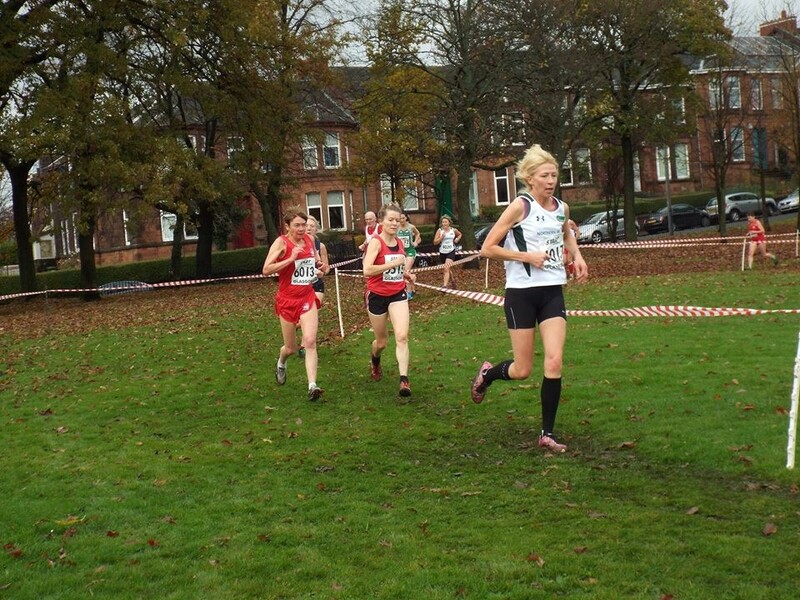 431 runners – many having completed cross-country events the previous day – made the 10 a.m. start and braved the chill winds which blew throughout across West Cheshire’s Chester Spring 5 mile course. In so doing, they helped set all manner of turnout records – exceeding the previous overall record turnout by 61, setting a new male turnout record of 297, and a new female turnout record of 134. Wallasey AC also set a record in fielding 65 club members but disappointingly after such a very good start to the season at Caernarfon, Eryri only had the five athletes competing. Steffan Williams led the way in 44th place overall in a new personal best time for the distance of 29:37 followed by: 124th (3rd MV/55) Arwel Lewis 32:27 pacing 125th placed and 1st MV/60 Derek Weaver 32:30. 191st Ashley Wager 34:37 and 424th Roy Jardine 50:25. The next race is at Birkenhead Park on Sunday 4th December 2016 at 11am. Four laps of the park = 5.5 miles. Huw Owen won the latest Penrhyn Parkrun on Saturday 5th November in a time of 17:08. Not sure if he had his dog pulling him along? On the same day further up the coast, Paul Wathan warmed up for the afternoon’s cross country race by winning the Conwy Parkrun in a time of 17:56 while his partner Gemma Morgan missed out by one second from being the first female home in a time of 21:11. It was Paul’s 18th Conwy Parkrun win! 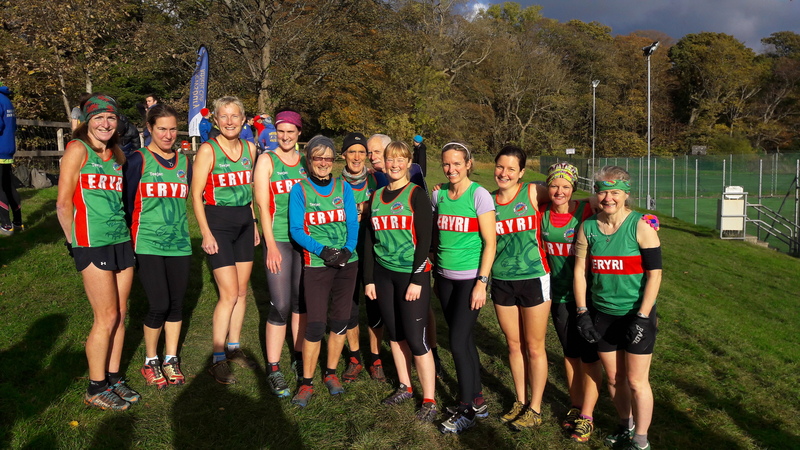 Fantastic team and individual results at Llandudno XC on Saturday – a brilliant turn-out with Eryri working hard and moving up the standings! Second race of the day but ‘men first’ this time to celebrate such a great turn-out. 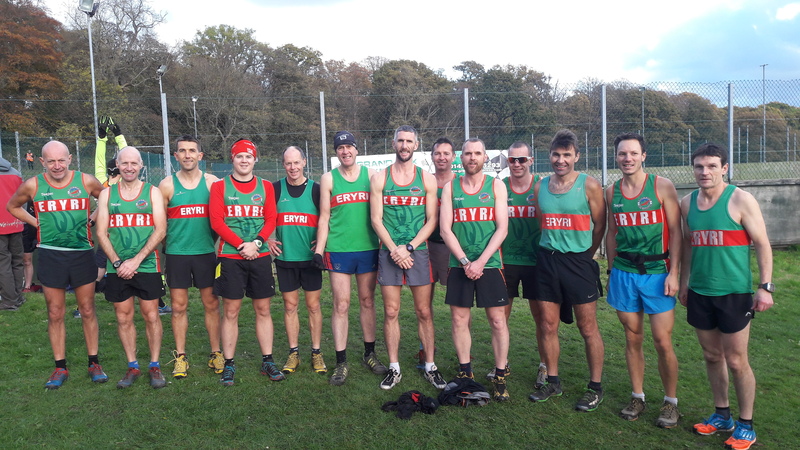 It was great to see Gwyn Owen (1st MV40 and 10th overall) and Paul Watham (19th) making a storming debut for this year’s cross country season. Matt Fortes (22nd) followed closely continuing his great season so far and, in his first cross country ever, Paul Jones (27th) also had a fantastic run. Rory O’Donnell, who just made the start line had a strong run and was in next (36th), followed by Russel Owen (1st MV55 and 42nd). Good packing by Arwel Lewis, Gary Porter-Jones (64th and 68th), then James McQueen (78th), Dils Rowlands (lucky number 100th!) and SPJ (107th, recovering from injury). Steffan Evans had a great sprint finish with a few from GOG triathlon, coming in 118th and great to see Maldwyn Evans (124th) and Eurwyn Edwards (133rd) completing the brilliant team effort from the Eryri Men – well done all – both teams were second on the day with the male masters team moving up to 6th overall and the senior men’s team have now moved up to 3rd overall! In the first race of the day, our Eryri ladies were also fantastic. Andrea Rowlands set a brilliant pace coming in a very strong 3rd and closely followed by the ever-improving Annabelle McQueen in 5th – fantastic running ladies! A strong run from Tammy Lewis-Jones (17th and 1st WV45), followed by Becki Law, Megan Hughes and Lou Emery-Jones (23rd, 24th and 31st). Unfortunately Helen Blair had to pull out with a pulled calf muscle but would have been ‘in the running’ here too. 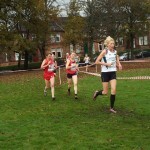 Ellie Salisbury was next in 53rd, then Jenny Williamson (67th), Alex Fletcher (86th), Becca Roberts (93rd) and Maggie Oliver (94th). 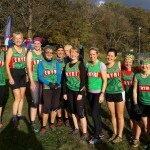 Brilliant teamwork – both of our women’s teams are now in 1st place overall! BIG MENTION to our two amazing male vet 70’s – Don Williams and Alwyn Oliver – coming in 70th and 90th in the same race and a 3rd and 5th in their category! A second BIG MENTION to the great supporters/helpers we had too – Sioned Rowlands, Stu Mcdonald, Neale Lewis-Jones, Craig Jones, Iorwerth Roberts, Judith Leslie and Becca’s Mum and Dad (Sue and Eric) – thanks and sorry if I missed anyone! Paul Wathan won the Tough Betws Trail Challenge 10k at Betws-y-Coed on Saturday 12th November in a time of 40:16 with Dylan (Caban) Jones on the comeback trail once again! 6th overall and 1st MV/40 in a time of 43:18. There were 280 finishers. On the same day at a wet and muddy Cheshire 10k in East Cheshire, Russell Bentley just missed out on 3rd place to Blackburn’s Ben Fish though Russell will be happy enough with 1st MV/35 in a time of 31:23 just two weeks after his Snowdonia Marathon success. Amongst the 1,394 finishers was Arwel Lewis who finished 3rd MV/55 in a time of 41:19.